The amphibious OptioWP digital camera features 5.0 megapixels of resolution and a 3X optical zoom lens and captures high quality images both on land and up to three feet underwater without an additional waterproof housing. The OptioWP is the perfect digital camera for active people who snorkel, ski, sail, surf and participate in a variety of outdoor activities or simply find themselves in a monsoon. You sacrifice neither size nor weight with the stylish, durable OptioWP. 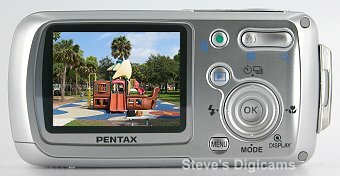 PENTAX kept the OptioWP's dimensions to a mere 4x2x0.9 inches and it weighs only 3.6 ounces. 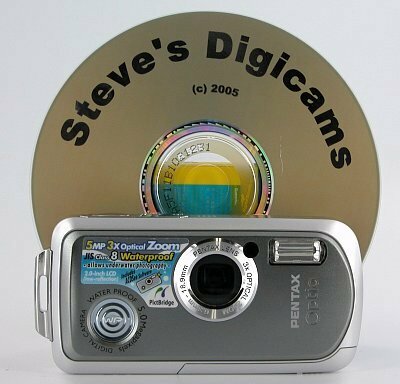 Despite the diminutive size, the OptioWP features a generous 2.0 inch low reflection LCD, 10MB built-in memory, quick start-up, an ultra fast nine point autofocus, and it captures QVGA movies at 30 frames per second. The design of the new OptioWP is not only stylish, it�s innovative. Every seam in the camera is protected with rubber sealant and an interlocking design to resist the enemies of all electronics including dust, pressure and moisture. 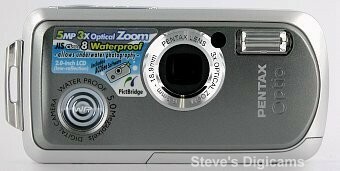 Inside, a powerful internal 3X optical zoom captures images as close 0.36 inches without ever protruding from the camera body. 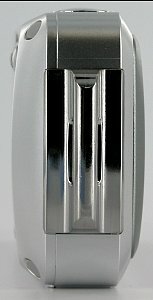 A special water-tight locking mechanism fully secures the camera�s rechargeable lithium-ion battery and SD memory card slot. 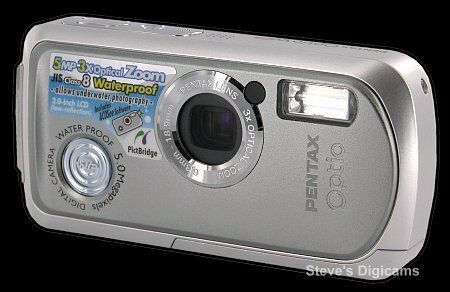 These technological design advances help qualify the PENTAX OptioWP as the first 5.0 megapixel, 3X zoom digital camera with a JIS Class 8 water resistant rating. 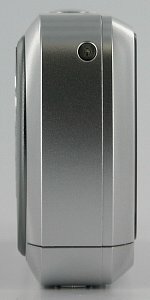 Continuous underwater picture-taking possible for 30 minutes at a depth of 1.5 m.